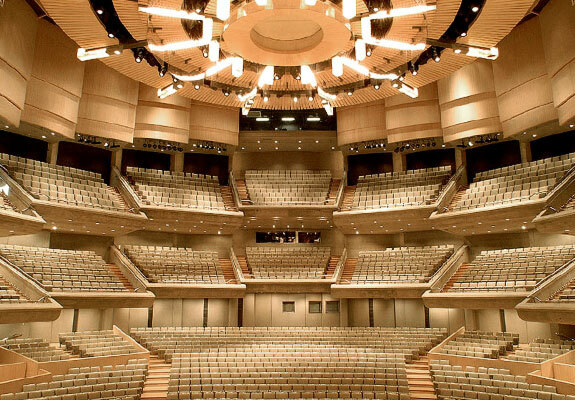 Located in downtown Toronto, Roy Thomson Hall (RTH) is a Canada's most renowned concert halls managed by the Corporation of Massey Hall and Roy Thomson Hall, a not for profit charitable organization. Roy Thomson Hall, located in the heart of the King St. theatre district, opened in 1982. Its curvilinear exterior design and sloping glass canopy, which is reflective by day and transparent by night, have made this concert hall a Toronto landmark. Roy Thomson Hall is the home of the Toronto Symphony Orchestra, premier venue for the gala screenings of the Toronto International Film Festival and the venue of choice for corporate events throughout the year. Roy Thomson Hall is located just next to St. Andrew subway station on the University Line. The King streetcar (Route 504) stops at the corner of King Street & Simcoe Street. Roy Thomson Hall is a short walk (5-6 blocks) north and west of Union Station. It can also be reached by subway (one stop from Union Station to St. Andrew).